Mr Dills loves to doodle, and if you do too – he’d love you to join him in this art session hosted at Rowntree Park Reading Cafe on Sunday 24th of February 10am-11am and a second session at 11.30-12.30 the same day. Mr Dills is a local artist and children’s book illustrator who wowed all the children in his session last year when he showed them how easy, and fun, it can be to draw! In this session, there will be a chance to create your own Pokemon character and trading card amongst top tips for drawing and design. The session is aimed at children aged 6-10 years of age (approx) and will be approximately 1 hour. Children remain the responsibility of their parents/carers through the session, but whilst they draw and create – you can chat and eat cake! (NB-It is possible the session may run over slightly but no longer than 11.30am). The cost of the session is £4 per child for Friends of Rowntree Park members and £5 for non-members. Mr Dills is a firm supporter of the Friends of Rowntree Park and will also be displaying some of his illustrative work based on the park, and York in general at the Reading Cafe over the coming months and he has also agreed to help us with some larger art in the park itself – what a guy! Why join the Friends of Rowntree Park? You can support the Friends of Rowntree Park for only £5 year per household. Your money goes toward our volunteers’ work in maintaining and improving the park, as well as running community events. You also get monthly newsletters, priority booking/discount to our events and 10% off in the cafe for the year. Join here. Please note – Tickets cannot be refunded but if you cannot come/sell your ticket on please let us know in advance. It’s been a wonderful half term in the park – glorious weather, lots of people out and about, and the Young Friends of Rowntree Park hosted a ‘Boat Making’ activity! Making the most of our park recycling, our young engineers set to work trying to create crafts that float. It was wonderful to see the problem solving and creativity that went on. Some fantastic designs and ideas – some more practical than others! Our Young Friends tested their boats out and watched to see if they floated. It was fantastic to see some resilient builders who assessed why their boats were not working as they hoped, and went back to the creation station to remedy this and modify their designs. This event was run by our ‘Young Friend’ volunteers Abigail, Christine and Ruth. Over 60 children came and all the money raised will go back into the park. The next Young Friends event is Den Building on Saturday the 2nd of June, followed by The Very Young Friends (0-5-year-olds) monthly meet up on Thursday 7th of June at 10am where they will be learning all about bees! All activities designed and organised by the Young Friends of Rowntree park are created for the whole family to get involved. Please see Facebook for up to date information on planned events. All Young Friends events offer a discount or free entry to Friends of Rowntree Park households. To join fr just £5 a year please go to http://www.rowntreepark.org.uk/membership or email membership@rowntreepark.org.uk for further details. Nature Ninjas spring into action! What an amazing start our ‘Nature Ninjas’ have had! This new after-school club has been running a few weeks now and it is proving to be lots of fun! Our Younger Friends of Rowntree Park have been trying out a variety of nature-based activities including den building, pond dipping, bug hunting and making birds nests. There is still a lot more to come throughout this half term – we can’t wait! The club of 15 children meet weekly on a Thursday after school. If you are interested in your child coming along to future Nature Ninja sessions that may run next half term, get in touch with the Young Friends via Facebook or via membership@rowntreepark.org.uk to register interest. All our events are run by volunteers. If you are interested in helping run and/or organise children’s events, we’d love to hear from you. The Young Friends also run monthly one-off events, more details can be found on Facebook. Where have all the Conkers gone? My own very young friend of Rowntree Park and I love to go out collecting things. We’ve found pine cones, seed pods, brown leaves, green leaves, red leaves, orange leaves and all the colours inbetween but NO conkers! We searched the woods area. We searched the play park trees. We searched all the trees and found nothing. Had all our other very young friends beaten us to it? Maybe it was the squirrels hiding them away for winter? Or maybe there were no conkers? A search under the trees found nothing (except in the play park where there were a few chewed up little bits of conkers) and a look up into the trees found no conker pods waiting to fall. We did find some brown shrivelled up tiny seed pods on the trees which had never made it into conkers. Sadly there are no conkers in the park this year. Back home we checked it out on the internet. We found a whole range of things which might have upset the trees. We found there is an insect call the Horse Chestnut Leaf Miner which attacks the leaves of the horse chestnut. The larvae mine within the leaves which then fall off. We also discovered another illness called Leaf Blotch where a fungus infects the leaves. We’re just hoping that it was caused by the floods last winter and that the conkers will be back next year. For this year though, we’re looking elsewhere for our conkers. If you know of any good conker trees around York, let us know! As a new venture for the Young Friends, we’re offering art workshops for children, on Saturday mornings, starting this Saturday, November the 9th. This week, Liz Collier, an exciting local artist, is going to be leading a session based on doodling. The sessions are totally FREE to Friends, and only £2 for others. 10am to 11.30 at Rowntree Park Reading Cafe. Suitable for all primary-age children. Booking essential; please email parkactive@rowntreepark.org.uk or phone 0758 290 2018. This summer’s Young Friends’ activities involve story telling and crafts. 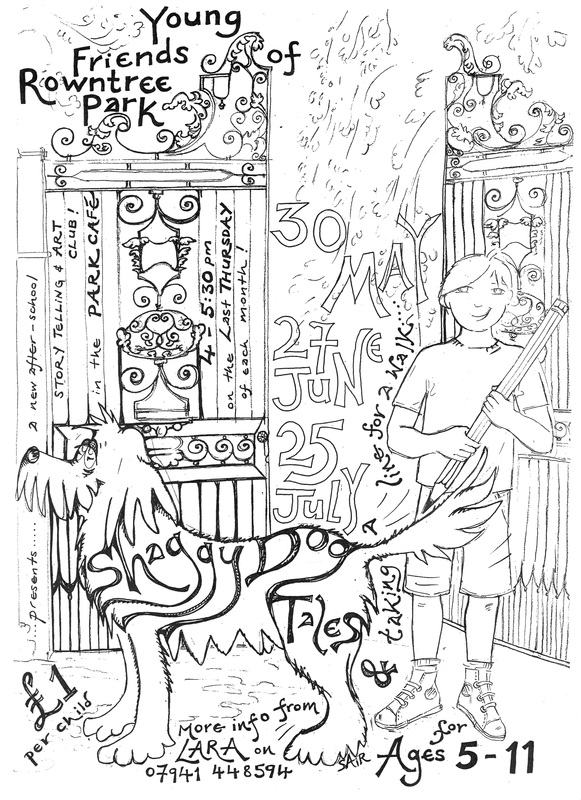 They have the theme ‘Shaggy Dogs Tales’; see the poster below for details of meeting dates.